Jenny Kramer knows she isn’t normal. After all, not everybody can see the past lives of people around them. Using the instructions in the music box, Ben and Jenny share a dream that transports them to Romanov Russia and leads them to believe they have been there together before. But they weren’t alone. Nikolai, the mysterious young man Jenny has been seeing in her own dreams was there, too. When Nikolai appears next door, Jenny is forced to acknowledge that he has travelled through time and space to find her. Doing so means he has defied the laws of time, and the Order, an ominous organization tasked with keeping people in the correct time, is determined to send him back. I wanted to love Endless. I really wanted to love Endless. Promise me a story of Romanovs, and you will hook me faster than… something hooked really fast. However, despite Romanovs and some interesting (though regrettably, too nebulous) timey-wimeyness, Endless fell flat pretty much across the board — romance, story, and world-building. 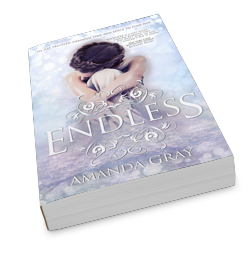 Endless has a pretty heavily romantic bent. There’s more to it than just that, but the romance plays a vital role in this story and greatly influences character decisions and plot direction. And I tried, but I just could not get on board with it… at all. It’s kind of made out to be this epic-love-that-even-time-itself-cannot-destroy, but the romance between Jenny and her leading man felt anything but. It’s lackluster, at best. Why? Exactly that. WHY?! Why did Jenny love him? Why did he love her? They didn’t really talk. You never got to see why they fell for each other, they just… did. They just are in love. And for me that just isn’t good enough — I don’t want to be told they have a connection, I want to witness it on-page. I want to feel it. Their lack of meaningful connection is especially apparent when it’s offset by Jenny’s friendship with another potential love interest who she actually DOES have a relationship with. They may not have some kind of star-crossed love across space and time, but they do have actual conversations, an emotional bond, and some intriguing tension. Yeah, so… obviously the love story is a hot-button issue for me. Also, the story and the world proved to be another mark against Endless. What started as an intriguing premise with promise, devolved into a story that I ended up pushing myself to finish. The romance being a large part of that, but also, the story was plodding, anti-climactic, and never felt… cohesive — an unfocused jumble of events that failed to generate any urgency. After a while I just started losing interest. I did enjoy the flashbacky/dreamy parts, and I wish there had been more of them. And the world and its workings? It’s too vague, explanations were far too vague to satisfy my curiosity. Overall, while the initial premise drew me like a moth to flame, Endless doesn’t have the depth required to captivate. Noo! That cover and summary seem like this book will be awesome. Bummer that it didn’t hit just right for you. I hate it when the romance is a huge part of the book/story arc and yet you never really feel it. Thank you for the honest review! I know the cover and summary are like… ImustreadthisbookNOW, but yeah, just didn’t feel it. Thanks so much for stopping by, Kristen! Oh, I’m bummed to hear this, too. I absolutely love the cover for this book, and have been looking forward to reading it. I’ll probably still give it a go, I can always stop reading if I don’t enjoy it.